The Hellenic Confederation of Commerce and Entrepreneurship (ESEE) is a peak organization representing the community of Hellenic Commerce, as well as SMEs at both domestic and international level. The founding of ESEE was the result of an arduous and long effort of the representatives of Greek commerce for the establishment of their own peak organization. Its establishment was made possible by the cooperation of local commercial associations that have been active in Greek society since the end of the 19th century and the beginning of the 20th century. The effort for a representive body on the national level went through a number of stages, assuming mostly informal forms in the beginning. Thus, the Commercial Associations Coordinating Council was formed in 1961. The Union of Commercial Associations of Greece was created in 1987 taking the form of a federation, with Panos Bitros, as President. The National Confederation of Hellenic Commerce was founded in 1994. The founding members were ten Commercial Association Federations, organized on a regional basis, covering the entirety of commercial activity in Greece. 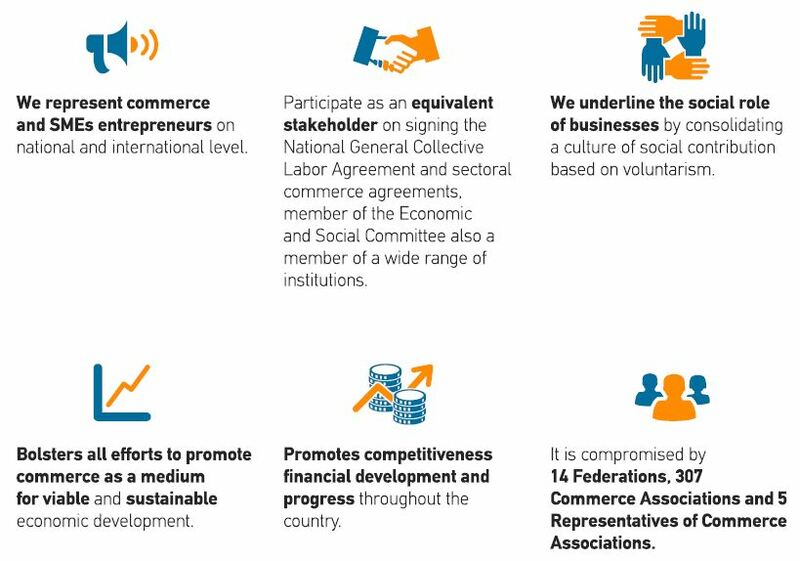 In 2014 the National Confederation of Hellenic Commerce was renamed Hellenic Confederation of Commerce and Entrepreneurship with the view to include officially within its scope, SMEs whose activities are not purely commercial. Nowadays, ESEE consists of 14 Federations and 283 Commercial Associations, representing the entire territory of Greece even in small towns. The strong representative of the Hellenic commerce and SMEs. ESEE is a powerful social partner that plays an institutional role in the Hellenic economy and society. ◗ Expends all efforts to help the commerce play the role of a genuine economic engine, which will promote viable and sustainable financial development. ◗ Intervenes in the governmental economic policy-making in order to create a friendlier environment for Greek and foreign investors. ◗ Intervenes promptly to address the emerging problems of the sector. ◗ Plans and implements support programmes for the commercial businesses as well as for small and medium-sized enterprises. other institutions promoting employment, (Manpower Employment Organization, Special Fund for Employment and Vocational Training, etc.). ◗ The KAELE (Hellenic commerce Development Centre), through its Accredited Vocational Training Centre, offers vocational training services to employees, selfemployed and unemployed. ◗ Puts pressure on the primary and secondary sectors to promote the production of better quality products at competitive prices. ◗ Supports commercial enterprises in upgrading their activities and helps the consumers to enjoy better services. ◗ Participates as equal social partner in the signing of the National General Collective Labour Agreement and other separate sectoral collective labour agreements. It also sits on the Economic and Social Committee as well as on numerous other institutional agencies. ◗ It also highlights the social role of the enterprises and seeks to establish a social involvement mentality on a voluntary basis. ◗ It sits on the Boards of Administration of the EuropeanAssociation of Craft, Small and Medium-sized Enterprises (UEAPME) and the European Association for retail, wholesale and international trade (EuroCommerce). It participates in the European Economic and Social Committee (EESC) and in the International Labour Conference of the ILO. It works for the development of economic cooperation in the EU, but also in the emerging markets of the Balkans, Black Sea and Eastern Europe.